Much of community ecology assumes that each species has its own “niche” and that evolution can lead species to evolve to unique niches. Darwin’s finches provide a good example, where these bird species evolved to be more different when together on islands, as compared to when they were alone. However, predictions about the evolution of the niche become more complicated in the context of entire communities where many species may simultaneously evolve. We began exploring how protozoa evolved in pitcher plants around 2008. 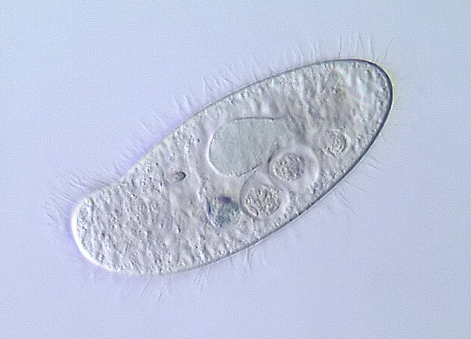 In particular, Casey terHorst did selection experiments with the ciliate protist Colpoda, demonstrating rapid evolution of both predation tolerance (terHorst et al. 2010) and interspecific competitive ability (terHorst 2011). Miller, Moran, and terHorst (2014) investigated how competitive ability evolved during succession in naturally occurring leaves, showing that poor competitors do evolve to become better in competitive environments, but that, oddly, good competitors evolve to has lower performance in intraspecific competition. The Miller Lab, along with the lab of Olivia Mason (EOAS, FSU), are now using this system to test predictions about how niches will change as species evolve. We are comparing the evolution of multiple species occurring in communities of increasing complexity. The evolutionary patterns of protozoa species are being quantified in 1-, 2, and 4-species communities, using pitcher plants grown in the greenhouse. This design is being used to ask if species evolve differently in communities of increasing complexity. The theory of niche partitioning, which is thought to lead to coexistence, will be supported if species co-evolve to have reduced competitive interactions, while niche convergence would be supported if increased competitive interactions evolve in multispecies systems. Specific traits such as cell size and other physical characteristics associated with feeding in the protozoa are being quantified. Next-generation DNA sequencing is being used to quantifying how the protozoa evolving in different combinations affect the underlying bacterial community.